I can think of various groups who could benefit from contemplating both this image and the words of Carl Sagan below it. 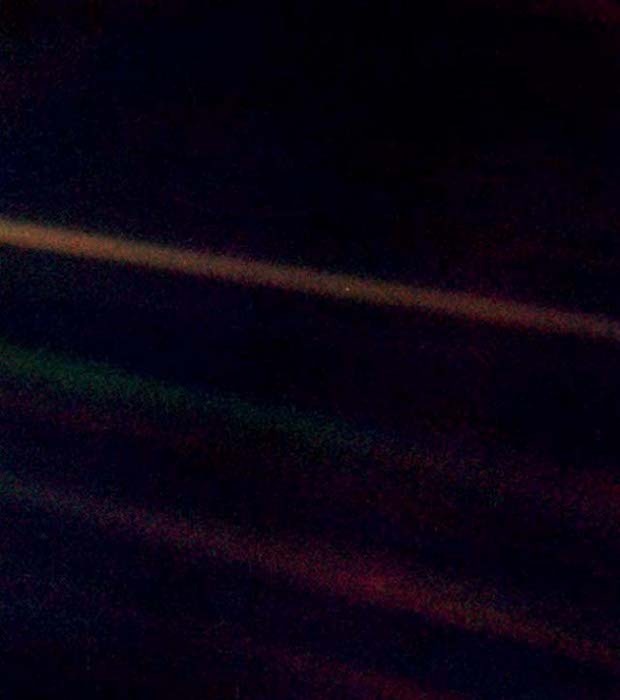 On February 14th 1990, Carl Sagan persuaded the controllers of Voyager 1 (a space probe on its way out of the Solar System) to turn the cameras around and take a photograph of Earth – from a distance of 4 billion miles. A humbling perspective of our beloved planet, that little dot near the centre; the apparent rays of light are not sunbeams, but scattering off the camera’s optics, a result of pointing it so close to the Sun. Look again at that dot. That’s here. That’s home. That’s us. On it everyone you love, everyone you know, everyone you ever heard of, every human being who ever was, lived out their lives. The aggregate of our joy and suffering, thousands of confident religions, ideologies, and economic doctrines, every hunter and forager, every hero and coward, every creator and destroyer of civilization, every king and peasant, every young couple in love, every mother and father, hopeful child, inventor and explorer, every teacher of morals, every corrupt politician, every ‘superstar’, every ‘supreme leader’, every saint and sinner in the history of our species lived there-on a mote of dust suspended in a sunbeam. Tagged Carl Sagan, pale blue dot. Bookmark the permalink.